Bronze wire cylinder brushes are used for conveyor cleaning or wide face brushing of a substrate in a production environment. Spiral wound bronze cylinder brushes are based on our strip brush technology, and are individually designed to meet the customer’s specifications. Paddle wheel style bronze conveyor cleaning brushes also utilize our strip brush technology and offer a customer -refillable brush core. Bronze wire is harder and stiffer than brass wire. We utilize a Phosphor Bronze wire, Alloy 510, consisting of 95% Copper and 5% Tin. The presence of Tin improves fatigue strength and tensile strength over the C-260 brass wire. Bronze wire normally will not generate sparks when struck against other metallic surfaces, and may be suitable for hazardous environments(1) . Bronze wire is a good conductor of electrical energy (15% IACS), and is suitable for static reduction applications when incorporated into a bronze wire strip brush with a brass or steel channel backing. Bronze is appropriate for operating environments up to 400°F constant temperature. Bronze wire is also relatively corrosion resistant. Spiral wound bronze cylinder brushes are typically mounted on a shaft or a tubular core. Brush strips are wound around and attached to the arbor in the appropriate density or spacing. 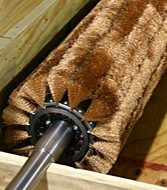 Close-wound conveyor cleaning brushes present a dense brush face and provide a consistent wide face scrubbing action. Open-wound brushes have spacing or pitch between the rows of helically-wound brush strips to facilitate moving loose product or debris to one side, to both sides, or to the center. Bronze cylinder brush outer diameters range from 1 5/8″ to 45″, while inside diameters range from ½” up to 30″ or larger with lengths to 20 feet. The strip channel material options are galvanized steel, stainless steel, brass and aluminum. The shaft or core onto which the brush will be mounted can be made of steel, stainless steel, or other materials suitable for the application. To learn more about bronze cylinder brushes, view our PDF catalog or contact us. Shaft: We can manufacture a solid or tubular shaft to your drawings or specifications, or you can supply your own shaft. Shafts may include keyways as required for drive purposes. Bronze cylinder brushes can be welded directly to the shaft or secured by means of metal clips attached to the shaft. Brushes mounted on a shaft are typically refillable as long as the shaft remains in good condition. Throw-Away Core: For the convenience of easy replacement, we can assemble the cylinder brush on an economical thin wall tube with end-bushings to be mounted onto the customer’s driven shaft. Rather than maintaining a spare brush on hand and returning the entire worn brush for refill, simply order a new brush and install it in the place of the old brush. Refillable Core: For a more economical long term solution, the core can be made from heavier wall tube and can be returned for refill multiple times. The shaft or journals may be an integral part of the core design or may be removable for ease of replacement. Refilling saves the cost of remaking the shaft or core. Unmounted Brush Refill: Customers may choose to buy the loose wound brush coil to mount on their own shaft or cores. Dynamic Balancing: For cylinder brushes operating at higher speeds, in excess of 350 to 500 revolutions per minute and depending on weight and size, dynamic balancing may be recommended to reduce vibration and improve the consistency of brushing action. Crating: Due to weight, size, and other shipping considerations, cylinder brushes over a certain size will be considered for packaging in a wooden crate which may be reused for future refill transportation purposes. This determination is made at the time of brush design, and the cost of the crate is quoted separately. To learn more about cylinder brush mounting options, contact us. Our engineers and experienced customer service associates work with you to understand the application, the material to be brushed, the desired finish, the operating environment, and the equipment on which your bronze cylinder brush will be installed. We will help you to determine the appropriate core, shaft, channel size and brush materials, establish power requirements, a recommended range of operating speed, and determine the need for dynamically balancing the cylinder brush. To learn more about bronze cylinder brushes, or to request a quote, contact Spiral Brushes today. (1) NOTE REGARDING HAZARDOUS ENVIRONMENT APPLICATIONS: Other components of a brass wire brush, such as the channel base, holding wire, brush holder, shaft, mounting tube, and bushings, might not provide the same non-sparking performance, so be sure to evaluate the entire brush and its interaction with the application before using the brush in a hazardous environment.